Sometimes you need to contact cPanel in instances where there appears to be a bug with the server which we cannot rectify. Then click on the 'Get Started' button. You may then need to create a cPanel Support Login which is easily done, just click 'Create Login' if you do not already have one. Once you are logged in, follow the prompts until you are redirected to the cPanel Customer Portal. 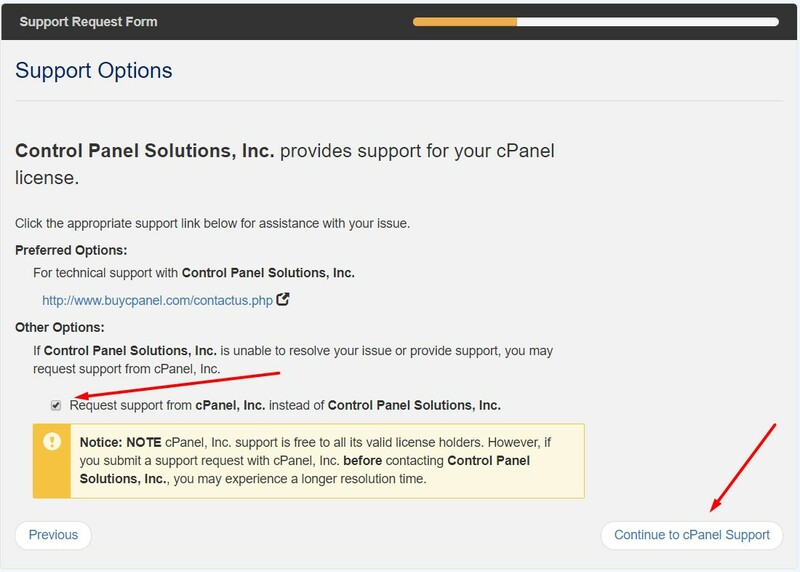 Here you will be asked whether to contact 'Control Panel Solutions' or cPanel Inc.
Control Panel Solutions is essentially us, so assuming you have asked us first, you need to click the 'Request support from cPanel Inc' checkbox to get help directly from cPanel. Then click 'Continue to cPanel Support' and follow the instructions to lodge the ticket with them.